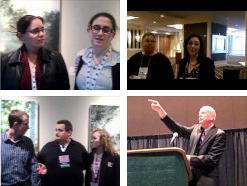 CoRioLiS: LGBTQs & Friends in the American Meteorological Society. Enjoy refreshments and hear from guest speaker Guy Walton, TWC forecaster, on “Acceptance and Innovation at The Weather Channel.” (By the way, after you hear Walton’s talk at the reception, consider catching his temperature extremes study Tuesday at 11 a.m.). or see CoRioliS on Facebook.